House price appreciation has slowed in the past several months in the US. An international comparison places recent US price changes in sixth place. Global house prices rose 0.39% for the first quarter of 2014, as prices increased for the fifth consecutive quarter. According to the Globalization and Monetary Policy Institute of the Federal Reserve Bank of Dallas global house prices are up 2% year-over-year. 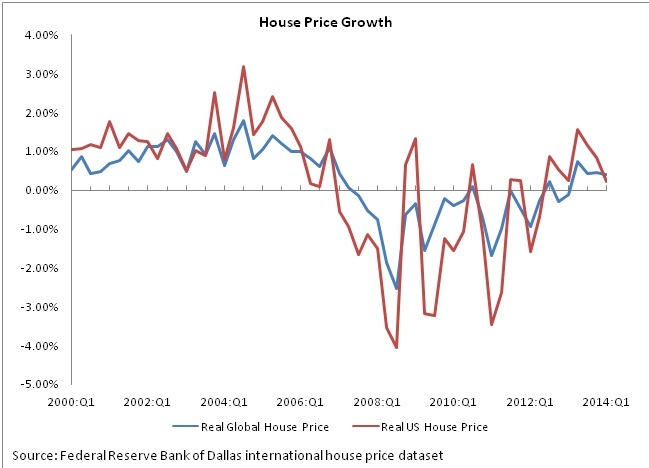 The Dallas Fed’s Globalization and Monetary Policy Institute publishes a quarterly house price index consisting of 22 countries. The database includes real and nominal house prices along with real and nominal personal disposable income. The institute selects a house price index for each country that is most consistent with the quarterly U.S. house price index for existing single-family houses produced by the Federal Housing Finance Agency. The index reported slower growth in the first quarter of 2014, rising by only 0.39% compared to increases of 0.46%, 0.42% and 0.75% for the last three quarters respectively. 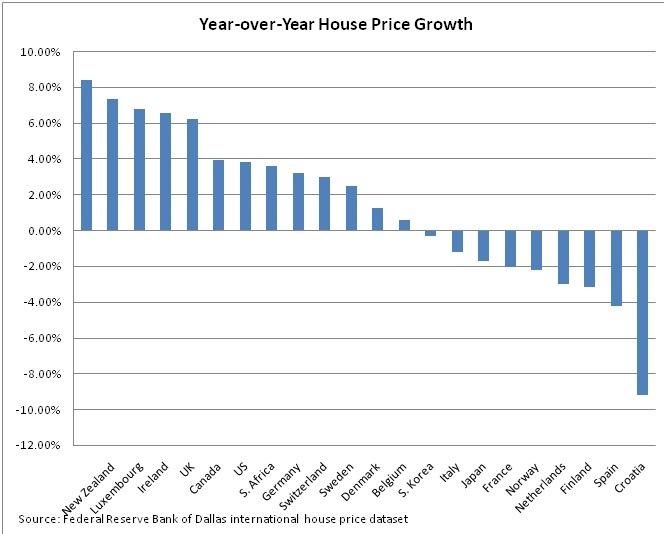 Nine countries recorded a decline in house prices year-over-year. Croatia experienced a 9% drop in house prices, the largest decrease, as a result of the nation’s fifth straight year in a recession. Croatia has not seen positive growth in its house price index since the first quarter of 2012. Australia experienced the largest year-over-year price growth with an increase of 8.4%, evidence the IMF considers to be a sign of a housing market that is rapidly becoming too pricey for household income in its country. US house price growth was strong enough to the place the United States in the sixth spot, slightly behind Canada. Of the 22 countries included in the database, 13 countries reported an increase in real house prices year-over-year. Australia, New Zealand, and Luxembourg experienced the largest price increases with 8.4%, 7.4% and 6.8% respectively. Finland, Spain and Croatia comprised the three lowest countries with the greatest decreases in price growth with 3.2%, 4.2% and 9.2% respectively. Data for the second quarter of 2014 will be released in the first week of October.